Death Valley is a desert valley located in Eastern California. Situated within the Mojave Desert, it features the lowest, driest, and hottest locations in North America. The depth and shape of Death Valley influence its summer temperatures. The valley is a long, narrow basin 282 feet (86 m) below sea level, yet is walled by high, steep mountain ranges. The clear, dry air and sparse plant cover allow sunlight to heat the desert surface. Summer nights provide little relief as overnight lows may only dip into the 82 to 98 °F (28 to 37 °C) range. Moving masses of super-heated air blow through the valley creating extreme high temperatures. 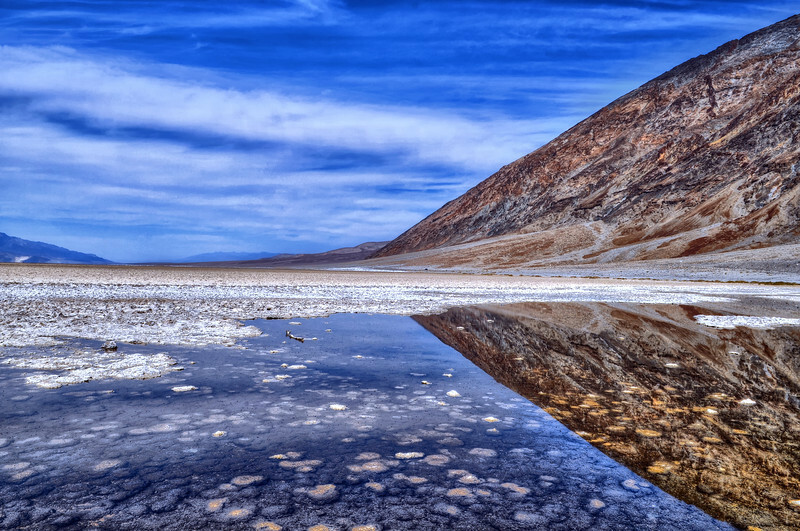 The hottest air temperature ever recorded in Death Valley (Furnace Creek) was 134 °F (57 °C) on July 10, 1913, at Furnace Creek. The lowest temperature recorded at Greenland Ranch was 15 °F (−9 °C) in January 1913. Lake Badwater: formed in February 2005 and long gone by February 2007. Remnants of this wetter period can still be seen in the region today, including the presence of several isolated populations of pupfish that still call the region home.